Let Us Inspect and Repair Your Roof. 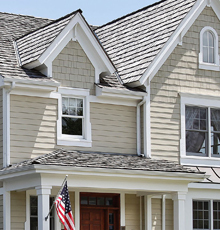 A new roof is often the most overlooked home improvement project. Because it is often not thought of, it is easy to forget about it until an issue arises with it. With Hometown Restoration Minnesota, we recommend a free examination to look at your roof and conclude your roof’s age and residual life expectancy. Should you need a new roof, we present long-term, sturdy, and appealing commodities for your selection. Hometown will collaborate with you to ensure you find the right merchandise to match your lasting home asset purposes. Our professional installers have earned Master Elite status and will provide exceptional quality workmanship. From estimating all the way through the final inspection, Hometown will be serving your best interest. We provide high quality service and products at fair prices to meet your roofing needs. We’re fully insured and licensed, and your satisfaction is our first priority. We carry a complete list of roofing products so you’re sure to find the perfect material for your project. 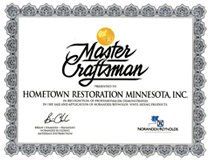 At Hometown Restoration Minnesota, we are proud of our superior artistry and consumer approval. 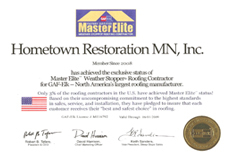 Our professional installers have truly earned their Master Elite status for exceptional workmanship. They are the best in the industry. 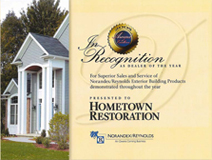 Hometown Restoration Minnesota is your local windows, siding, roofing, gutters, insulation and storm damage specialist in Minneapolis and St. Paul, MN metro area. Committed to quality, we use attractive and long lasting products offered at affordable prices. Our professional installers have Master Craftsman and Master Elite status for exceptional workmanship. This allows us to warranty our materials for 50 years, the best warranty in the business. We are here to help you have the most attractive and energy efficient home possible. Licensed and insured, call (763) 494-8695 now for a free estimate.